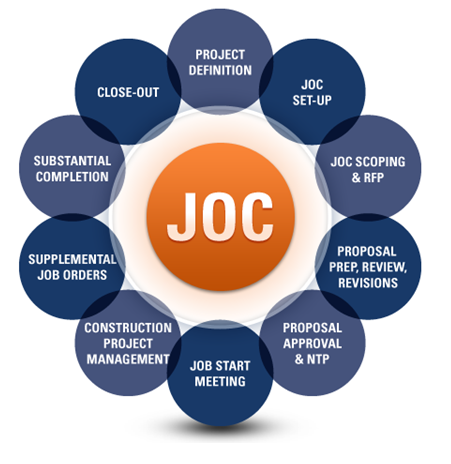 Job Order Contracting – JOC (also known as SABER in the Air Force) is an efficient way of getting the numerous, commonly encountered renovation, repair , remodeling and smaller construction projects done faster and collaboratively under a single contract. Job Order Contracting provides increased productivity, accurate reporting mechanisms and transparency. Fast and timely delivery of projects. Low overhead cost of construction procurement and delivery. Development of a partner relationship based on work performance. Virtual elimination of contract disputes. Standard pricing and specification utilizing a published unit price book (UPB), i.e. RSMeans Cost Data, resulting in efficient and effective estimating, design, and fixed price construction. Top-performing JOC contractors achieve a high percentage rate for completion of projects on time and on budget. Also, the JOC process provides for a single contract to be used for the delivery of multiple or repeated work orders without having to re-bid the same work as required in other commonly used delivery systems. It allows for back and forth communication and development efforts throughout a project. This differs greatly from the one way, antagonistic methods such are design-bid-build. JOC provides the greatest advantage in situations involving recurring work when delivery times, type of work and quantity of work are indefinite. While JOC is not used for major new construction, it is best for minor new construction, adjustments, renovation, repair and maintenance of facilities. Partnering and performance incentives result in high-quality construction and service and enhanced quality control. Quality JOC contractors have reduced and even eliminated punch lists. Simplified design documents and acquisition processes negate the need for complicated and repetitive contract documents and reduce contract administrative costs. The speed of JOC contracting ranges from 10 days to 21 days from request to construction start, since JOC projects don’t demand soliciting and acquiring a contract along with detailed plans and specifications. Facility owners do not have to provide a complete design, but rather rely on the JOC contractor to produce any essential drawings for the design. Employment of smaller subcontractors in the area to perform the work, allowing for the majority of the project funds to be spent locally. Minimal risk for the owner in the event of problems with the contractor because the owner can stop using the contract at any time. If a performance-based system is also used, the JOC contractor can be terminated for lack of performance. A win–win attitude or motivation for both the contractor and the facility owner produced by and through the long-term relationship.